By this point, you know exactly what you’re going to get from a Michael Bay Transformers movie: explosions, metal things hitting other metal things, explosions, awkward and sometimes insensitive attempts at humour, more explosions, and so on. It’s a formula that Bay has stuck to for four films in a row now, and has turned into a Marmite franchise as a result. Most if not all top critics hate it – currently at 17% on Rotten Tomatoes, it’s the lowest-ranking entry yet – while most audiences seem to get a real kick out of it – $100 million in its opening weekend in the US, the highest opening of any film so far this year. As it turns out, however, this reviewer just happens to have a good taste for Marmite, but that is NOT an indication that this movie is technically a good one because it really isn’t. Transformers: Age of Extinction’s biggest problem lies within its redundancy; as mentioned, Bay has only managed to make the exact same brainless CG-fest that he already did with the previous three films and, even worse, seems to be under the impression that the audience is dumb enough to not notice. Many of the action scenes, especially those that take place in large populated cities as per the previous films, feel like pale re-treads of what came before, and thanks to a combination of its way-too-long running time of 165 minutes and abuse of the clichéd shaky-cam technique prove exhausting to watch after a while. They’re not as straining to look at as before, and to the film’s credit it does has some impressive CGI, but it’s like sculpting Michelangelo’s David entirely out of faecal matter: there’s some beauty in the visuals, but at the end of the day it’s still crap. It’s almost pointless to go into the plot of a Transformers movie because, once again, people will be going in for the explosions et al and not give a rat’s behind about what the heck is going on. It’s as nonsensical as ever, as if they were making it all up as they go along (though would you really be that surprised? ), with enough plot-holes to close an entire motorway junction. Some of the plot devices are so baffling that they really need to be seen to be believed – for example, Bay seems to one-up James Cameron’s infamous “Unobtainium” by dubbing the film’s invented metal source “Transformium”, we are dead serious – and, as usual, nothing makes a lick of sense even in a logic-free world that Bay has created. Not only that, but everything is played much more straight this time round, with the lowest-common-denominator humour all but wiped clean and replaced with an overbearing sense of po-faced seriousness. When characters die in pretty silly ways, it’s made out to be rather grim with characters becoming emotional when talking about it afterwards. It’s as if Bay somehow read The Christopher Nolan Guide to Making A Summer Blockbuster, but only read the chapter about making high-scale action with a humourless vibe. The new human cast, fronted by Mark Wahlberg’s inventor Cade Yeager – again, dead serious – come off with more dignity than Shia LaBeouf and co thanks to their slightly more grounded characters (keyword: slightly). Wahlberg has proved in the past he can play goofy and get away with it thanks to his natural charm (see Ted and even The Happening for proof), and here he’s no exception as he plays with what he must have known was stupid material and turned it into something entertaining and smarter than it really is. Kelsey Grammar and Stanley Tucci, as devious government-types waged against our heroes, also seem to be relishing in the over-the-top roles given to them, while Nicola Peltz – despite some promise by the actress – continues Bay’s uncomfortable tradition of gender inequality in his films by playing a screaming, short-shorts-wearing pretty-faced damsel in distress. This is sad, because other female actresses like Li Bingbing and especially Sophia Myles (who seems to be doing her best Imogen Poots impersonation) definitely show signs of personality but are underserviced by a script that fails to ogle them as much as the camera seems to on Peltz’s rear, TMZ-style. 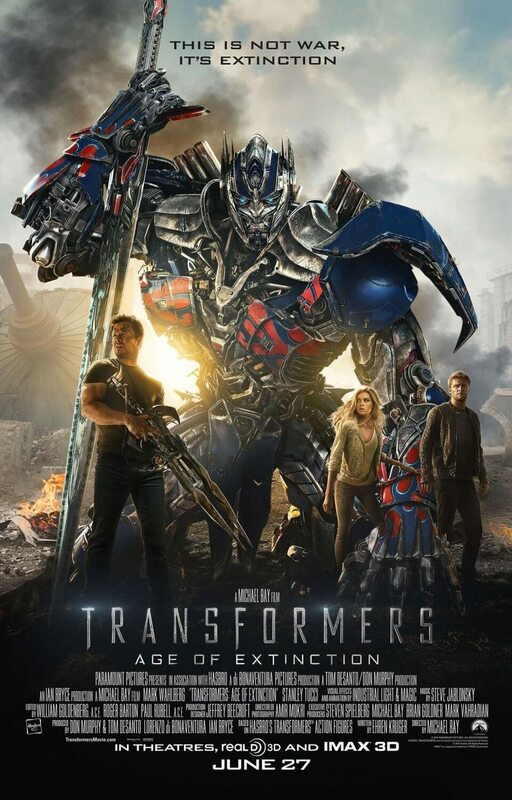 As you might be thinking, and you’d be right, Transformers: Age of Extinction is a dumb, DUMB movie, one that takes itself more seriously than it should. And honestly, that’s what makes it the most watchable out of the series. Like it or not, it delivers what audiences want to see out of an insane summer blockbuster including brick-for-brains plot and characters, escapist action sequences and, of course, a comical overuse of the production’s pyrotechnic department. But in a world where people are more drawn to smarter and far better outings like The LEGO Movie and How To Train Your Dragon 2, there are occasions where we’d like to step back, switch off our brains and just enjoy the ride. At the end of the day, that’s what Transformers: Age of Extinction is: an occasion where we treat ourselves to the worst possible junk food there is, and we don’t have to care because it’s a calming, if unhealthy, release. 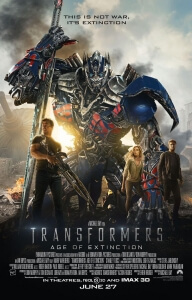 Transformers: Age of Extinction is nowhere near as painful as the previous sequels, but it still suffers from several moments of redundancy, a nonsensical plot, an overlong running time and action scenes that leave you more exhausted than the fancy cars our robot friends disguise themselves as. Only for franchise purists, and for anyone who just wants a loud, dumb blockbuster amidst the smarter crop of films out at the moment.